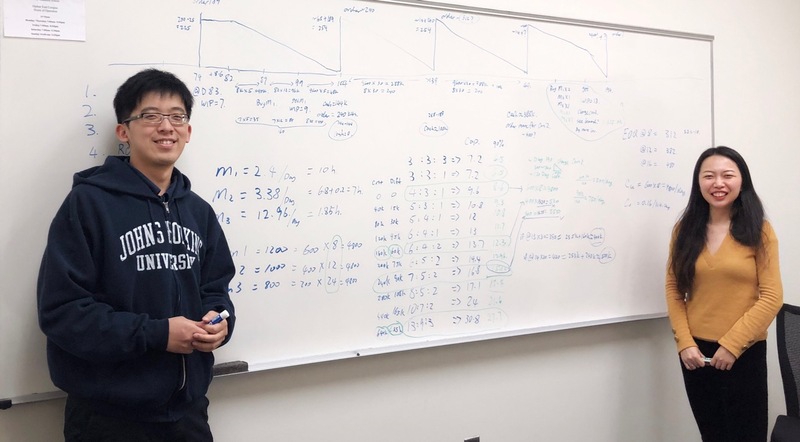 Continuing the trend of recent case competition successes, a Johns Hopkins Carey Business School Global MBA team took top prize in the 15th annual MIT Sloan Operations Simulation Competition, held April 7, 2019, in Cambridge, Massachusetts. Facing formidable competition from nearly 100 challengers, including teams from Carnegie Mellon, Chicago Booth, Columbia, Duke, London Business School, Michigan Ross, MIT, Northwestern Kellogg, UC Berkeley, Yale, and Wharton, the Carey team won the $3,500 first-place prize in what is considered the toughest quantitative challenge for any MBA student. It was Johns Hopkins’ first time achieving this renowned honor. The challenge presented to all schools was a simulated exercise in bailing out a hypothetical near-bankrupt firm and subsequently making it as profitable as possible, by investing in capacity, seeking financing from banks, streamlining inventory, pricing products dynamically, and improving management customer relations. (Known as “Littlefield Technologies,” this factory simulator, used at more than 50 business and engineering schools, was co-developed by Johns Hopkins University provost Sunil Kumar while an assistant professor of operations management at Stanford University Graduate School of Business.) The intensive experience called upon students’ top-notch analytics, operations, and leadership skills, among other talents. In addition to the winning Carey team (consisting of Dong Pan and Elaine Yang, both class of 2019), the other three teams, each of which made the top 20 finalists, included Grace Tsai (class of 2019) and Zifei Zhao (class of 2020), finishing in sixth place; Yuanbei Tang (class of 2019), finishing in ninth place; and Xuming Zhang and Qifan Zhang (both class of 2020), finishing in 20th place. This honor was just the latest in several competition achievements over the past few months. In February, a first-ever team of Carey and Maryland Institute College of Art (MICA) students studying together in the MBA/MA in Design Leadership program made the final round and presented to judges in the prestigious Rotman Business School Design Challenge. Also in February, a team of Johns Hopkins University students, including three from the Carey Business School, won first prize in the annual Yale Healthcare Case Competition, while another Carey student won a personal award at the Fisher KeyBank Minority Case Competition. In addition, that same month, a team of Carey students finished first in the Washington, D.C./Baltimore area CFA Institute Research Challenge.